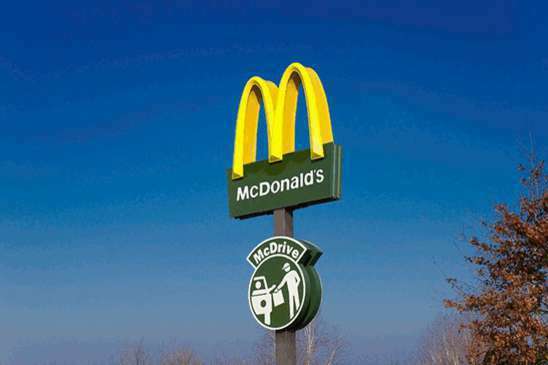 (SNN) - McDonald's Restaurants of Canada is implementing major changes to its service on the heels of a new health and safety ruling issued by Human Resources and Skills Development Canada. The ruling, which was issued to the multi-national fast food chain on July 5, 2013, concluded that serving McDonald's customers was dangerous as there were a lack of controls to protect staff from Filet-O-Fish-flinging-related injuries. Given this alarming state of affairs, HRSDC ordered McDonald's management to take action and "alter the activity that constitutes the danger no later than Aug 1, 2013". Acknowledging HRSDC's concerns, McDonald's president, John Betts, confirms that food-flinging injuries are definitely a problem. "The problem isn't only the Filet-O-Fish. Big Macs and Quarter Pounders can really pack a punch too," says Betts. "Several of our employees have sustained head injuries from food thrown by otherwise polite Canadians who were frustrated with long line-ups or who received soggy sandwiches that looked nothing like our ads. In fact, one of those employees is still in a coma at the Ottawa Hospital." In order to address this growing problem, the fast food chain is taking steps to protect its employees by implementing a number of safeguards. "First of all, we'll be outfitting all front-line staff with new bullet- and sandwich-proof uniforms, which will include a helmet and CSA-approved visor. This should reduce the number of head injuries substantially," boasts Betts. In addition to the uniforms, management is also looking to implement a locked-door policy to force all customers to drive-thru windows. "The drive-thru is the ideal solution for keeping customers away from our staff. In fact, we'll be going one step further by installing an automated ordering system where clients can submit their orders to Siri, Apple's voice-activated assistant." When prompted about Siri's ability to properly take orders, Betts waves his hand condescendingly. "The newest release of Siri has way fewer bugs than the original Apple version did, so we're confident she'll get 75% of the orders right. If not, there will be a keyboard that clients can use to type in their order." With the deadline of August 1 looming, management is continuing to explore other options to "beef" up safety. Additional measures under consideration include converting franchises into Burger Kings to reduce the client base to virtually nothing, and staffing of drive-thru windows with renegade militia enforcers to effectively deal with client concerns. "If clients have a problem, they can rest assured that it will be dealt with expeditiously. " Photo: Some rights reserved by zigazou76 flicker photostream, The Sage nor this article endorsed.